This month we visited Burly and the Bean’s Coffee Cabin. 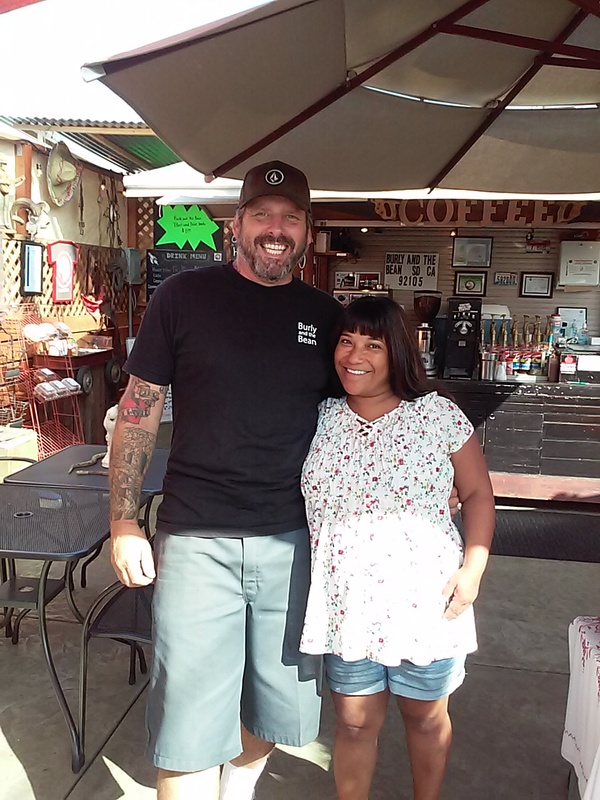 Burly and Bean are the nicknames of the owners and they are inspiring entrepreneurs. They’ve been at this location for a year, but had a coffee cart nearby prior to that. We indulged in mocha coffees with intriguing names like Hot Like Me (Mexican chocolate, cinnamon, Tabasco) and Nut You (with almonds and hazelnuts). Both were amazing and will prompt us to return to try other interesting offerings, but only the bravest will try their strongest coffee, the Eye of the Storm, with six shots of espresso! Burly is a self-trained barista and is enthusiastic about creating wild new concoctions. Daymar Beans (www.daymarcoffee.com) is their roaster. Marvelous mochas in a garden setting! Burly and the Bean is located at an intersection with plenty of parking nearby on each of the two streets. The ambience is eclectic as this coffee spot has become a magnet for memorabilia given to them from customers. There is a lending library and an organic veggie garden area with a picnic table and ripe veggies are shared with customers. The day we were there a trio of adorable children were there making balloon hats and dogs as well as offering garage sale finds in their mobile garage wagon. Yes, of course we had to purchase from these young entrepreneurs! Burly and Bean are on the go planning a neighborhood chili cook-off in August. They have also opened a second shop at City Farmers Nursery, a 100% organic full-service nursery at 3110 Euclid Ave. (at Home): www.cityfarmersnursery.com. 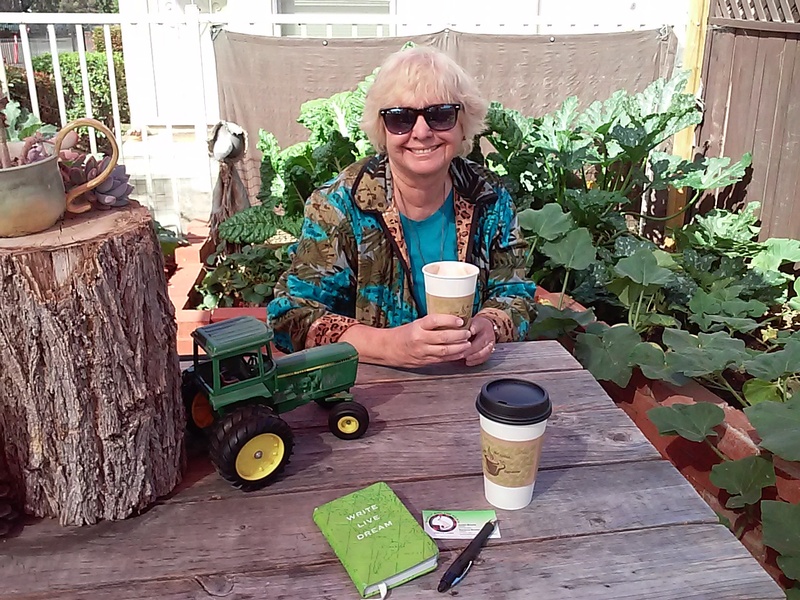 Their City Farmers Nursery coffee hours are Thurs.-Sat., 8:00am to 2:00pm. 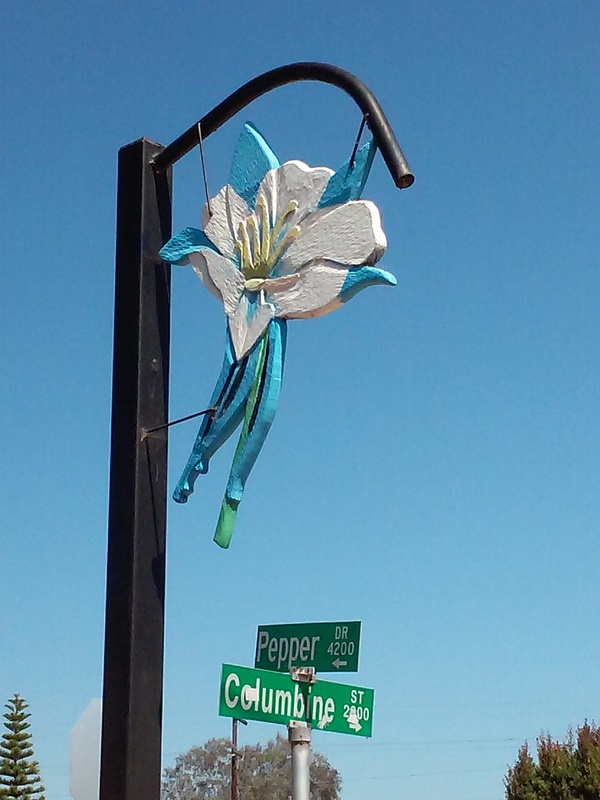 A Columbine flower marks Columbine Street. It’s a destination you won’t want to miss! Come for the coffee, of course, but while you’re there explore the neighborhood of Azalea Park where you’ll notice wooden carvings of flowers & leaves posted around the neighborhood (see the example of a Columbine flower). It took me awhile to realize that they correspond with street names like the example, plus Poplar, Iris, Tuberose, Violet, & Dahlia. Art is also found in the community park at the southern end of Poplar St. (see the sculptures in the photo below). What brought me to Azalea Park the first time were the canyons that just about surround the neighborhood: Manzanita Canyon is to the north, Hollywood to the southeast, Swan Canyon is nearby, and 47th St. Canyon is near the City Nursery. If canyon exploring is your plan, wear sturdy boots & carry water. A hiking stick helps, too, just never explore a canyon alone. There are maps at http://sdcanyonlands.org/programs/canyon-enhancement-planning-program (scroll down for the “City Heights Canyons Loop Trail”). 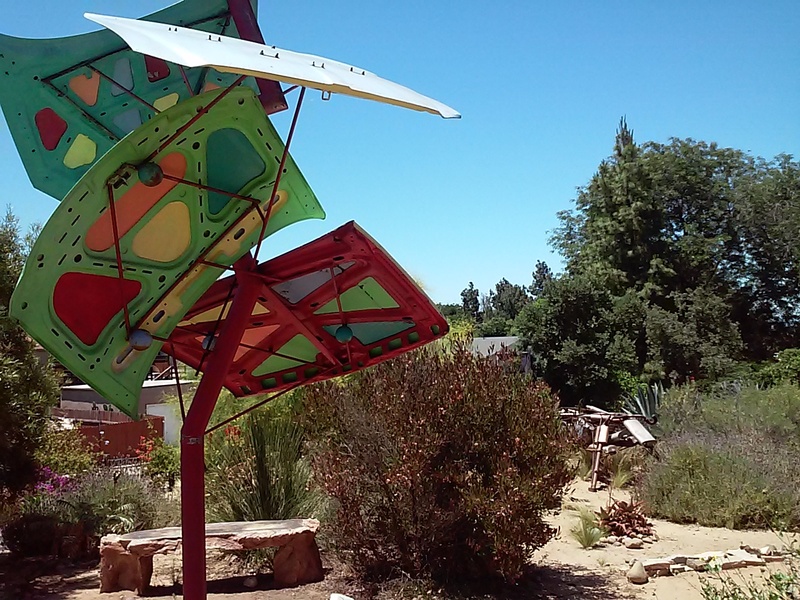 The car hood shade structure, called Joy Ride, was designed by Jim Bliesner, a neighborhood artist. The muffler bull was designed by Karim Carlock, another neighborhood artist. Both were fabricated and installed by Ironworkers Local 229 volunteers. 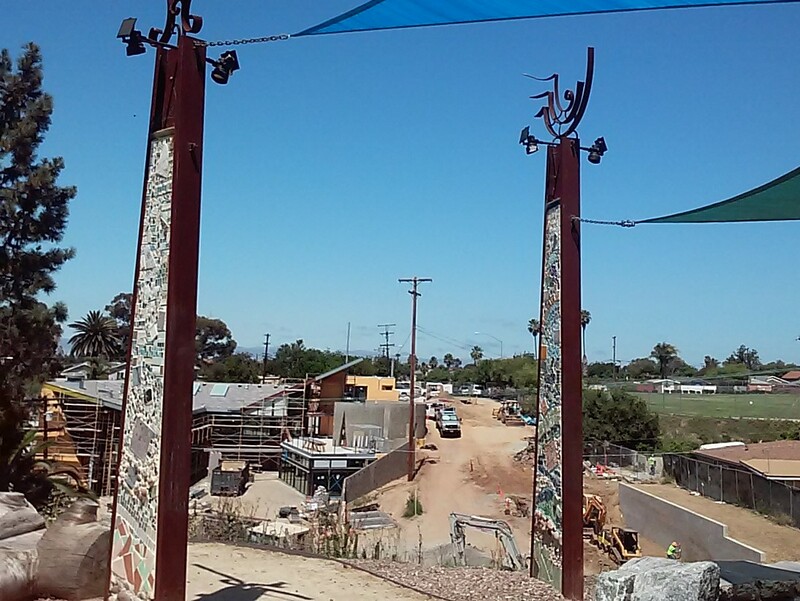 The Ocean Discovery Institute’s Living Lab (under construction) viewed from Manzanita Gathering Place, an art installment at the north end of Manzanita Canyon. The Living Lab was designed by Rob Quigley. This entry was posted in art, Coffee shops in San Diego, free books, library books and coffee, mocha and tagged Azalea Park, canyons, City Heights, Ocean Discovery Institute Living Lab. Bookmark the permalink.